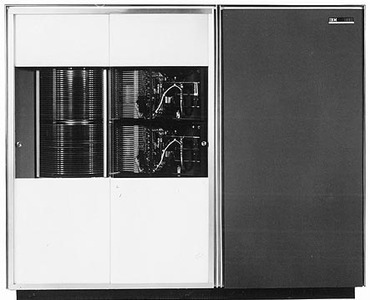 Announced September 23, 1963 and withdrawn February 9, 1965The IBM 1302 Disk Storage was an improved version of the IBM 1301 with four times the storage capacity. It was used with the IBM 1410 Data Processing System and the 7000 series of computers. The number of tracks per inch and bits per inch in the 1302 had been doubled from the earlier 1301, resulting in a quadrupled bit capacity to 117 million 6-bit alphanumeric characters per module. A recording density of 1050 bits per inch had been achieved by reducing the thickness of the magnetic storage medium and the spacing between the recording head and disk. The track density had been doubled to 100 per inch while maintaining the same access time. Average access time to a record was 165 milliseconds, and an entire cylinder of 234,000 characters could be scanned in 1.3 seconds. The following is the text of an IBM Data Processing Division technical press release distributed on October 17, 1963. The new IBM 1302 disk storage unit has more than twice the read-write speed (data rate) and four times the capacity of the IBM 1301 disk file. Up to five 1302s can be attached to one data processing system for a total storage capacity of more than one billion characters. A total of 117,000,000 six-bit alphameric characters can be stored on the 1302, model 1, a single module file. The 1302, model 2, a double module, can store 234,000,000 characters. The 1302 reads and writes at the rate of 184,000 characters per second, more than twice the speed of the previously announced 1301 disk storage unit. The 1302 features two access mechanisms in each module. Each mechanism provides access to 250 independent recording tracks. The access mechanisms can both seek at the same time, or one can seek while the other is reading or writing. Each module of the 1302 has 20 separate revolving data disks, making available 40 surfaces of data storage. There are 500 recording tracks on each disk surface, twice the number of tracks provided by the 1301. Up to 5,850 characters may be recorded on each disk track. The 1302, using the same instructions as the 1301, can be incorporated in any of the following IBM data processing systems: 1410, 7010, 7040, 7044, 7074, 7080, 7090, 7094 and 7094 II. With the 7631 file control unit, 1302 files can be shared by any two of these systems. With the 1302, as with the 1301, track and record addresses do not have to be consecutive or even sequential. Two positions of track address are reserved for the user to code as he sees fit. These two positions can be filled with an identifier unique to the record. The 1302 then automatically checks this identifier before retrieval or updating. When used as the hub of an integrated IBM Tele-processing system, the 1302 makes accessible to remote locations the vast pool of information stored in the disk storage unit. An IBM data processing system using the 1302 permits access to insurance policy information for personnel in the field as well as the home office. It provides insurance companies with an information system that makes available, for example, 5 million 200-character policy records. By using the 1302 to store policy records, the status of policies can constantly reflect any changes made by the policyholder or company. An IBM computer -- with a 1302 -- can accept data in any sequence, store it, analyze it and provide information on demand. As new information comes in, it can be fed into the computer which then posts all related policy records, keeping them up to date and accurate. In the manufacturing area, constant business changes must be incorporated into existing plans. A computer system utilizing the 1302 allows transactions to be processed as they occur with updating of affected files. When required, information can be printed out by the computer and made available to management on demand. This can provide better control in areas such as forecasting, order processing, material planning, perpetual inventory control, scheduling, dispatching, job costing, engineering, data processing and accounting. Adding a 1302 to an IBM data processing installation allows a bank to have available at all times an automatically updated file of customer accounts. It makes possible remote inquiry of records in storage by individual departments or branches, thus permitting faster customer service. A 1302 can mean improved performance in typical banking application areas, such as demand deposits, time deposits, loans, trust operations and safe deposit activities. Use of an IBM computer and a 1302 enables public utility companies to provide immediate and accurate answers to information requests from customer and management alike, as well as to update the file from service orders. The 1302 can furnish up-to-the minute facts about revenue figures, accounting records, system load data, credit ratings, materials and supplies, personnel and payroll. In addition, inquiry stations allow a company to tap the 1302 file from various locations -- executive offices, local offices, customer service department. Customer questions can be answered while the party is still on the telephone. Information affecting management decisions is available just as quickly. A data processing system with the IBM 1302 can be effective when applied to various areas of administration. Motor vehicle departments can use the system to process routine operator and vehicle transactions immediately while making current and complete information available to branch offices, courts and insurance companies. The speed of information retrieval possible with the 1302 can also make it an invaluable tool of law enforcement agencies, finance agencies, institutional systems, highway departments, employment security agencies and public welfare. The 1302, which will be manufactured at IBM's San Jose, Calif., plant, will be available in the second quarter of 1965. Model 1 will rent for $5,600 a month and sell for $252,000. Model 2 will rent for $7,900 a month and sell for $355,500. The basic rental for a 7631 capable of controlling up to five 1302s is $1,185, with a purchase price of $56,000.